You’ve read the studies on smoking and MS risk. Heck, you’ve read a lot of information about the negative effects of smoking. You’re a one- or two-pack a-day smoker and have been for a long time, you have MS, and your doctor has been telling you to quit for years. Now you think you’d like to try. But how do you do it? Health professionals are required to tell you to quit but many are poorly equipped to help you do it. People tend to lecture and scold a smoker, but nobody offers concrete, non-judgmental ways for you to start the journey of quitting. As a person with MS and a smoker who is mostly smoke-free, I can tell you things your doctor probably hasn’t told you. I highly recommend contacting a tobacco treatment counselor. Hospitals have programs devoted to this, so do an internet search, or look through the phone book, or contact your local hospitals and ask about their programs. Tobacco treatment counselors take an entirely different approach than you might realize. Not only do they have detailed knowledge about the mechanisms of all quit-smoking methods and substances and their impact on your body, they won’t chastise you if you happen to fail a particular method. They will simply go back to the drawing board and work with you on a plan B, and, if necessary, plan C, D, E, and F, too. Your program is tailored specifically to you, there is no one-size-fits-all method of quitting tobacco. Counseling can be done entirely over the phone if you choose, and if your assigned counselor isn’t available, you can always talk to one of their colleagues if you need to. Of course, if you choose to take one of the quit-smoking prescription medications, you’ll get that from your doctor, but you will work with the TT counselor on the method portion of the process. Should you experience any drug side effects that are troublesome, you should first contact your doctor. My own TT counselor is a seminar speaker who educates doctors about TT methods and treatments. (Just one more reason to see a TT counselor rather than a doctor—why not go directly to the expert?) When I first spoke with her and revealed my MS, she already knew about the initial MS-and-smoking study, which impressed me. We started with nicotine replacement products which didn’t work for me—and I have since tried hypnotherapy, the e-cigarette, and Zyban, all without success—until, finally, Chantix, which did make me quit. But there are two challenges to quitting smoking: Finding a method that helps you quit, and then staying quit. The first challenge was easier for me than the second. The TT counselor will teach you to use various tools as a way of distracting you from a craving. I have sugarless gum and sugarless hard candy next to my chair of which I indulge often. Another tool is a drinking straw cut to the same length of a cigarette, which simulates its shape and size. These two types of tools address the oral and tactile cravings, both of which are psychological. 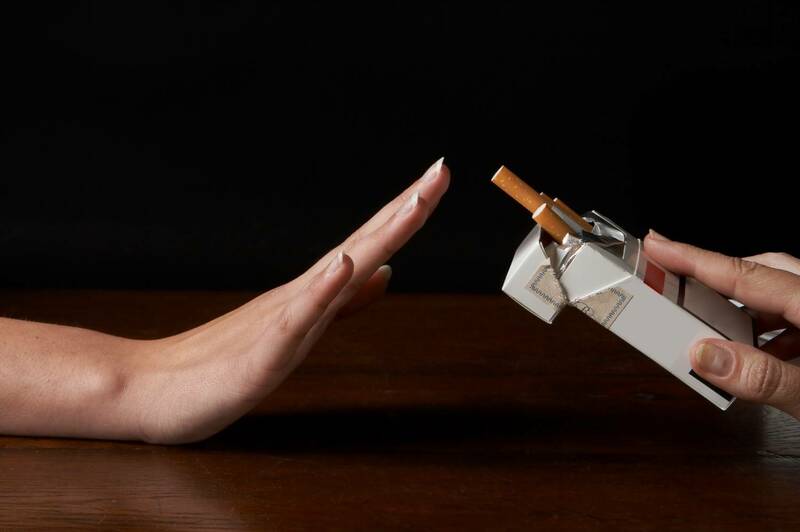 After you quit smoking, nicotine leaves your body within 2-3 days, so that addictive voice, as I call it, is your brain telling you to use that familiar coping tool—a cigarette—to deal with your boredom/stress or trauma/nervous energy/gloomy mood/anger/sadness/helplessness/creative burst/obsessive thinking/happiness—which pretty much covers everything, doesn’t it? No wonder it’s so hard to quit and stay that way! Luckily, as long as I take Chantix after quitting, I don’t have a need for the straw and my cravings are either absent or so mild I can ignore them. My final challenge is what happens when I stop taking Chantix. I tend to relapse after a while, though I smoke very few cigarettes when I do. Soon I’ll be contacting my counselor to discuss this last leg of a long journey. There are so many reasons to try to quit smoking that are not MS-related, several of which are lung/esophageal/oral cancers, hardening of the arteries, coronary disease, and stroke. My mother and her two brothers all developed lung cancer, though two had quit smoking long before the diagnosis. I take genetics and behavior into serious consideration when I think about the effect smoking might be having on me. When you’re ready to examine your family medical history and think about quitting the habit, I hope you’ll remember that quitting now will start reducing your cancer and cardiovascular risks. It will have a positive impact on your MS health, too, now, and in the future. It’s never too late to quit.